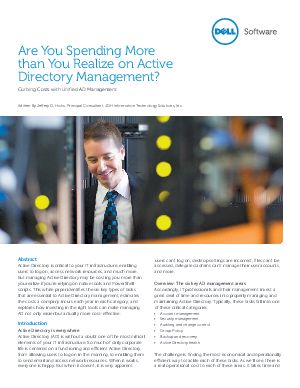 Research Library > Dell Software > Are you spending more than you realize on Active Directory Management? Active Directory is critical to your IT infrastructure, enabling users to log on, access network resources, and much more. But managing Active Directory may be costing you more than you realize if you’re relying on native tools and PowerShell scripts. This white paper identifies the six key types of tasks that are essential to Active Directory management, estimates the costs a company incurs each year in each category, and explores how investing in the right tools can make managing AD not only easier, but actually more cost-effective.